One of Jane Austen's most beloved works, Pride and Prejudice, is vividly brought to life by Academy Award nominee Rosamund Pike (Gone Girl). 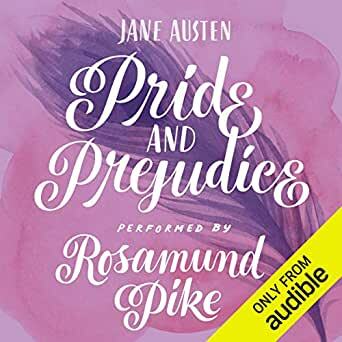 In her bright and energetic performance of this British classic, she expertly captures Austen's signature wit and tone. Her attention to detail, her literary background, and her performance in the 2005 feature film version of the novel provide the perfect foundation from which to convey the story of Elizabeth Bennett, her four sisters, and the inimitable Mr. Darcy. 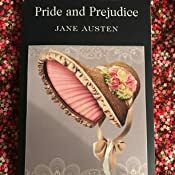 After reading the first few chapters (The chapters are very short) of Jane Austen's "Pride and Prejudice" I wondered how anyone could be interested in such pompous, egotistical, aloof and self serving characters? After reading on I said, "Wow! How could I be so interested in such characters?" Getting toward the middle of the book, I was hoping that it would never end. By the end of the book, I fully realized what a magnificent piece of writing I had just read. 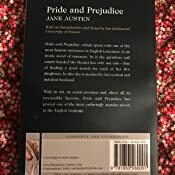 "Pride and Prejudice" is one of the best sociological studies about early nineteen century British loyalty and society I have ever read - where title, rank, fortune, and good looks are in many ways the requirements of an approved marriage, much, much more than love. In fact, this wonderful book might not be as relevant today as two hundred years ago, but there are still many traces of such societies throughout the world, today. It was not all that long ago in America, where marrying outside of your religion, or ethnicity, was looked down upon. 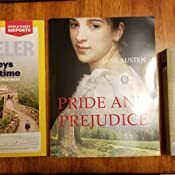 The book is full of wonderful characters, but Elizabeth (Lizzy) Bennet is, in my opinion, the star. Her character is so wonderfully and fully realized that at times I felt her jumping off the page and directly into my life. Liza, a fellow member and friend on Goodreads, informed me that she had read the book twice and still was not sure if the ending was 'sad' or 'funny.' To me, it was funny and exceptionally rewarding but sad to think that a lady's livelihood depended more on the wealth and rank of your partner than love. 1.0 out of 5 starsAn appalling error! 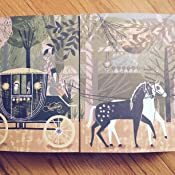 There must be many thousands of digital versions of Jane Austen's Pride and Prejudice. I got this because I wanted to compare it with another that I had, and didn't realize until it was on my kindle that the name of the author on the cover page is incorrect!! The author is NOT Charlotte Bronte!!!!! This is so inexplicable and appalling a mistake, I had to write and mention it so that it can (hopefully) be corrected. The rest of the text is fine. I don't want it on my kindle, and have deleted it. How anyone could have confused Jane Austen and Charlotte Bronte (author of Jane Eyre) is beyond me. 5.0 out of 5 starsCan you ever have too many copies of P&P? The print edition of this book is awful. It's an awkward size so line lengths are too long to read comfortably. It is evident that basically no work was put into laying out the text of the book: line spacing is too close, there's no page breaks before chapters, chapter headings are the same typeface as the surrounding text. Typography is general is very poor: quotation marks that should be “curly” are instead "straight", for example. This book looks like someone just copy-pasted the raw text of the book, slapped a cover on it and called it a day. Zero effort went into making this. Do not buy this. The size of this book is way too big like a magazine. I am not sure why you decided to print a book like this. The feeling of this book is like it was printed from a PDF file. I think the purpose of these kind book is to be read, carried and stored easily. Magazine can be printed bigger because it needs space to arrange the pictures. And why I buy a paper book and not going with digital? Because I want the feeling of reading books! Especially these kind of classic books! Very right hand one is the one I got from B&N bookstore. Much better feeling to read. And it's cheaper.